The Residhome Puteaux La Défense centrally located in the new Ecoquartier des Bergères eco-district offers a welcoming, dynamic and modern setting. Close to many restaurants and shops, it is ideally located, so everything you need for your daily life is close at hand. With plenty of shops and restaurants close by, your rental apartment is just a short walk away from the Quatre Temps Shopping Center, which is full of fashion boutiques, attractive decor and big brands. 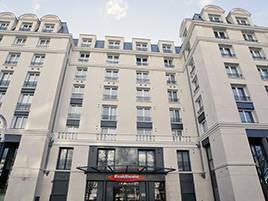 Puteaux train station is just a 10-minute walk from the apartments and the center of La Défense is also 10-minutes away by public transport (bus or tram). Puteaux is a lovely, dynamic and very attractive town. To the north, lies the business district of La Défense (which also extends to Courbevoie, Nanterre and, since 2010, La Garenne-Colombes). Some of the most emblematic buildings of La Défense are in Puteaux, including the Grande Arche, and the Centre for New Industries and Technologies (CNIT). The Notre-Dame-de-la-Pitié church is a must-see tourist attraction during your stay at Puteaux. This landmark was built during the XVI century and has been classed as an historic monument since 1975. A warm and functional environment will allow you to relax, work, and receive friends, family or colleagues. With 24/24 reception, the aparthotel is composed of 139 studios and 11 apartments, all equipped and furnished. Each apartment and studio has a fully equipped kitchen (fridge, hotplates, dishwasher), a private bathroom and free Wi-Fi connection. Some apartments are equipped for people with reduced mobility and, in addition to the facilities of studios, a sofa bed in the living room. You will appreciate the free amenities and services such as wireless internet or weekly cleaning.